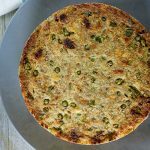 This Instant Pot Stuffing (which we call cornbread dressing) is sure to be a hit on any holiday table. We love it with gravy and cranberry sauce! Using the sauté setting – add 2 tablespoons of oil to pot. Then add onions, celery, bell peppers, and 1/4 teaspoon of salt. Cook for about 5 minutes, until veggies are soft and translucent. This is your only chance to cook them, so make sure they soften. We don’t want crunchy celery. Meanwhile, remove the meat from 2 turkey thighs. Should be a total of about 1 1/2 cups. Chop turkey into small bean-sized pieces. Set aside. Turn off sauté setting. Add all remaining ingredients to pot and mix REALLY well. Spray a 7-inch pan with nonstick cooking spray. Pour all ingredients into pan, spread out evenly, and pack down firmly. Cover with aluminum foil. Pour 1 cup of turkey stock into pot (do not rinse out first! ), then add a 3-inch trivet. Place pan on top of trivet, lock lid, and cook at high pressure for 30 minutes. Once cook time is complete, quick release pressure. Remove pan from pot, take off foil covering, and place in oven under high broiler for about 5 minutes to crisp the top. While making you own turkey stock is not required, I highly recommend it... Add 4 turkey thighs to pot and season with 1 tablespoon of salt and teaspoon of black pepper. Cover turkey with 8 cups of water. Cook at high pressure for 30 minutes, then allow pressure to release naturally. Remove turkey and set aside. Pour broth through a fine mesh strainer to remove impurities. Use broth in all your favorite holiday recipes to take them to the next level. You'll have both extra turkey and stock with this method.